This one's for the mockingbird who has started my morning with laughter for two days running. They're funny, no? How they can carry on for hours with their pitch-perfect impersonations of all the other birds of the Kingdom who cross their path. Oh, Love: what a sense of humor on You! "I love it except for one small detail," he wrote. "You fail to give yourself the credit you deserve. Your words carried great weight. Because of you, this is a book full of stories, not academic ramblings and generalizations. Second, you said to me at one point “This feels like a small book.” That simple sentence lifted a weight and allowed me to trust that I could finish this..."
It's funny, because my column started out being about how any one accomplishment is everyone's accomplishment. How our achievements don't occur in a vacuum. How countless others create them with us in ways seen and unseen. But along the way, the piece changed direction. I felt concerned about being misunderstood. 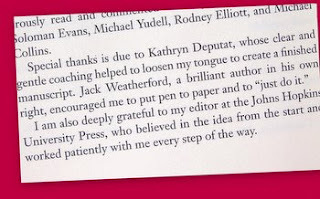 Would readers--John included--think I was trying to take credit for his work? I didn't want to chance that, so I wrote something else. I did feel a part of his result. But I didn't actually know the extent of my role until receiving John's note. I'm grateful to know it, and for the validation his words lent to my initial impulse. That impulse was born of my recalling, as I slipped his new book from the mailer and started paging through, a particular achievement of my own about eight years back. That achievement culminated in my standing before my community of fellow leaders and assuring them that all my results of the previous six months were equally their results. I insisted that none of my achievements would have occurred without them. I'm not sure they believed me, or completely understood, but I knew it was true through and through. So thanks to John for opening this subject again, prompting my return to it, to tell this part. It feels important if not imperative--now more than ever--to realize, acknowledge, appreciate the extent to which we are all in this together, joined in mutual creation--or destruction, depending. By and for all of us, despite any appearances to the contrary--moment by moment, choice by choice, act by act--we bring our collective creations into form, with no one part in this co-creation any larger or smaller than any other. Shame on me for forgetting that! Like so our World is created--for better and for worse, like it or not. Flowers are coming to me these days. Maybe it has something to do with my having intended that--even putting it in writing a few weeks back. But when I wrote "The gift of a bouquet of flowers" on my list of intentions, I didn't imagine they would come to me the way they have. I'd even forgotten I'd asked for them until after bouquet number one--of two, so far :) --materialized. The first was all tulips plucked fresh out of my friend's kitchen table vase and wrapped in foil to send home with me. She had harvested them from the overgrowth around an abandoned home near hers. Tulips! Tulips are untouchables to me. 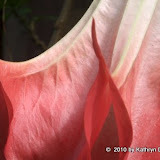 A sort of sacred flower--like the endangered woodland flowers--you admire and enjoy in the garden but that only on very rare occasions take a place at the table. She'd handed me a treasure, and I could not contain my delight. The second bouquet wasn't a bouquet at all at first. It started as refuse, in fact. I'd set out for an athletic, long walk, only to have it interrupted by the cemetery dumpster about a half mile from my house--mounded, I could see as I approached, with discarded funeral baskets and sprays. I am no stranger to these to say the least. At 18, I married into the funeral business. I don't know about today, but in those days, anyone married to a funeral director had occasion to enjoy a sweet reward, sprinkled in now and then among the inevitable and often extreme demands and inconveniences of that line of work. Sometimes, after the wake, there was an excess of flowers: too many for the family, too many for the grave site, too many for the nursing homes, even. For me, flower lover that I am now and have been for as long as I can remember, that translated to an imperative: "Bring some home!" That is how I came to be delighted from time to time by the surprise of an arrangement or two tucked into our back porch. I would break down the baskets: pull the stems that seemed worth saving out of their florist's sponge, lay them on the kitchen counter, and then...begin anew! Florist for a day, I'd take out my vases and pruners, and start snipping and arranging. Before long, I had bouquets for nearly every room. I can honestly say I don't know anyone who enjoys flowers as much as I. It's fair to say I have a passion for them. You could even say I have carried on a lifelong love affair with them (no surprise to friends of Love's Freeway, I'm sure). What else would have me bringing them with me when I move from place to place in the house--downstairs, during the day, and upstairs to rise with come morning. And to wit: for the past several days, I have made at least a daily visit to the pink rose-tulip (a tulip that looks more like a rose than a tulip) in my garden. There's just one, and I forget and remember it every year. Remembering is like this: "Oh, you! Ahhh...." at its first appearance each spring, followed by sinking my nose into its tall narrow cup to breathe it in. The fragrance is uncommon among tulips, I think. It is fruity, bordering on citrus. Sweet grapefruit, to be exact. In my church-going days, we practiced something called "veneration." We would venerate the cross on a particular Holy Day--around Easter, I think. And we would make devotions at the Stations of the Cross on Good Friday, following Jesus' Via Dolorosa. I saw these as acts of reverence and adoration, and my way with flowers is much like that. I confess that I adore them. The red of the three Darwins in the back garden here, beneath the canopy of lilac about to burst and commence our intoxication. The bold cheer of the pansies to my left, and beneath their planters, a migrant vine or three of pachysandra, unusually abundant with purple star-blooms. Well anyway, all things considered, it won't surprise you I'm sure that I started plucking a flower here and a flower there from that dumpster heap. Rescue! Resurrection! I could see there was a chance for some of them. Before I knew it, I held a thick bouquet almost too fat for my grip. Funeral flowers, of all things. Trash in the eyes of the caretakers of the cemetery--and probably everyone else as well--but not to me. Daisies, spider mums, stock, carnations, asters: I even tried three roses, the most fragile genus of the lot. They'd been in still-damp sponges, and if I wasn't mistaken, would perk up after a fresh cut. It's funny that I rushed back with them, given all they'd been through, all they'd survived already. But the quicker they hit water, I knew, the better their chances. And water was the first thing I gave them of course, after the vital first aid of a trim to their stems. Time would tell which would make it and which would not. I set out on my walk again, and when I returned an hour later, I could hardly believe my eyes. Like magic, all but one (a lavender rose) had sprung to life. 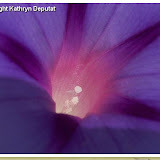 I feasted my eyes on them, pert and vibrant: an abundance of life and beauty so many lovelies to behold! Oh yes, I do love flowers. And clearly they find some creative ways to love, to seduce me. But there was another factor at play in this particular seduction: I am hard pressed to turn a blind eye on any chance for resurrection. Flowers, plants, creatures, loves: if there's still a chance for life in it, I want it saved. You might remember my story of the lover who frowned on my saving butter wrappers and leftovers. I suspect my 'Former' would have frowned on this particular act of repurposing too, would have argued that these flowers had well served their purpose. I would not disagree. They expressed the love and condolences of the deceased's family and friends. They offered comfort to the bereaved. They decorated the fresh grave. And some were beyond hope for sure; but others were only thirsty for water. Anyway, here they are, alert and alive! Two weeks from now, the carnations (and others perhaps) will still be alive. Beyond the enjoyment they will provide me over this time, it will please me to see these beauties, these particles of Love, complete their life cycle, expire in their own time. And all it took was a bit of attention, a little devotion. All it took was a little love. ners. As a consequence of that happenstance, we made an immediate connection, and his voice on paper made a distinct impression on me. Thank you. You are exceedingly gentle, real and honest - these are rare qualities. You are a careful teacher. Two months later, I met with John Rich for our first of a handful of sessions spanning about a year and a half. We got him and the project on track for sure, and then John took the ball and ran with it. The rest, as they say, is history. My part in John's achievement was small, but an absolute grace and a privilege. I was touched by the stories of Wrong Place, Wrong Time long before they got anywhere near a printing press. "I don't look at a young black men the same..." I told him in one of our sessions. I could see this touched John in return. Of course, because it was just the sort of (r)evolution he hoped to cause by writing all this down, by getting it out in the world. ous note and inscription. I might as well have been greeting a new grandchild when I opened the package, for all the joy and pride and admiration I felt! This book is a blessing, a change maker, an instrument for peace. That is why I am mentioning it here, why I am praising and acknowledging the work, its subjects, and all who had a part in its coming to be. Give yourself the gift of reading it. When I came to the first class, I was nervous. I felt like I had entered a room full of writers as an imposter. I remember that you instructed us first on the “how” and then asked us to write from the prompt “I remember.” I wrote something about my grandmother’s kitchen, unsure where to start and how to finish. When you invited me to read, I said “It’s kind of a mess.” You offered me the option to pass, but I went ahead and read. The group jumped in with recall which plucked out pieces of my short passage. I will never forget this: you turned to me and said “Still think it’s a mess?” That was a turning point.